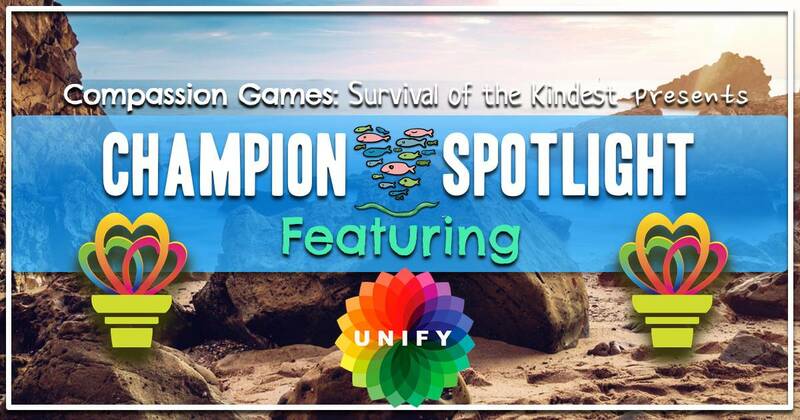 Unify is one of Compassion Games most celebrated partners in the regeneration of self and society at this time. For Day 5 of the Water is Life! Protect the Sacred Earth Week, we are deeply dedicated to highlighting the remarkable work and accomplishments of Unify by passing them the Compassion Torch! See Co-Founder of Unify with the Global Champion of Compassion Torch in this video below! It is our conviction that we are One Human Family, transcendent of race, religion, or nation. By unifying at these times we create a living demonstration of our underlying unity and an Emerging Planetary Culture which embraces the interdependence and well-being of all. Unify also hosts a World Water Day in March. Their video on Water Day, featuring Indigenous leader Ta’Kaiya Blaney, is truly inspiring. Unify helped host an Earth Gratitude series in honor of Earth Day. Learn more about Earth Gratitude and the free Mini-eBook they offered, downloadable here. Unify continues to inspire us and countless millions around Mother Earth to lean into the vision of the world we know in our spirits is possible. Thank you, Unify. Be sure to follow Unify on social Media!